In the animal welfare world, you'd be hard pressed to find a subject that touches more people and stirs more emotions than the horrible, "cultural" practice of torturing dogs and cats and then eating their flesh. 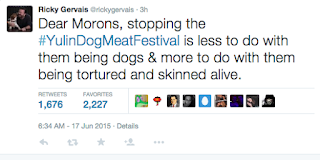 China's annual Yulin Festival has sparked an international outcry, no doubt in part due to celebrities such as Ricky Gervais, Peter Egan, Dame Judi Dench, and Gisele Bundchen taking up the cause to stop this barbaric practice. Over the past two years two organizations, NoToDogMeat and saynotodogmeat.net have been speaking out and raising donations to fight the dog meat trade. The problem is the groups and their respective supporters have spent almost as much time maligning each other on social media, each proclaiming the other to be a fraud, as they have speaking out for the animals. 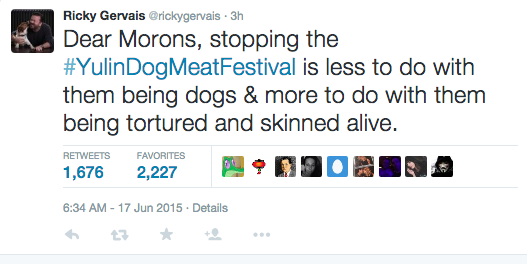 Let's look at, "NoToDogMeat" first. A public records search will tell you the organization is indeed an umbrella under the registered charity, "World Protection for Dogs and Cats in the Meat Trade" in the UK. A little over a year ago I was approached by a few people who had concerns the organization was not legitimate so I took to Twitter to ask some very simple questions. 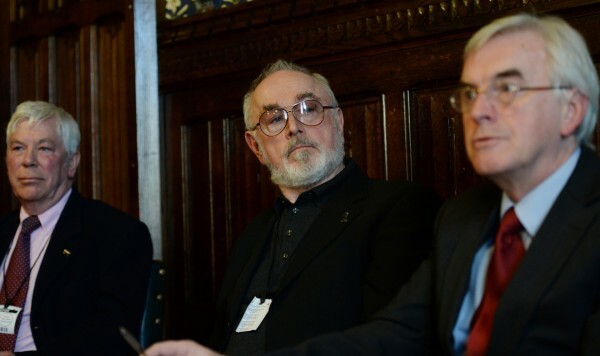 Instead of receiving straight forward answers I, along with actor and UK Ambassador for Animals Asia Peter Egan, found ourselves on the receiving end of harassment and threats of being sued by the CEO of NoToDogMeat and the organization's supporters. It was hardly how I expected to be treated by a registered charity. Upon seeing my questions would not be answered I simply decided to keep an eye on the organization. Fast forward to this week when I came across an article, "When 'Charities' Attack : How I Became The Target Of Online Abuse". Its author Dr Dan Allen writes about online abuse he received upon asking NoToDogMeat about a large fundraiser the organization held. The fundraiser was set to raise funds for an animal advocate in China by the name of Mrs. Yang, who reportedly had worked tirelessly in the past to save dogs and cats from the meat trade. Unfortunately it appears less than 1/4 of the raised funds actually made it to Mrs. Yang in China. When I tweeted about the situation I called out NoToDogMeat for being a scam. That is what I consider any organization that keeps donations intended for another party. The responses, as you can imagine, were heated. The majority stated I knew nothing of what I was talking about, and that Mrs. Yang is in fact a fraud who has kept the funds sent to her, and who abuses animals. Hi if you would like to contact me I would be glad to speak to you by phone. Meantime please remove your defamation. It will be great if you can write about Mrs Yang. I have a 16 page report having visited her personally and I will soon be back in China as we have a legal case against her for fraud. I also gave an interview to the New York Times. As you may know Mrs Yang lied to the world about who she is and what she does. We raised alot of money to rescue dogs from Yulin but sadly she did not save a single one with donors money. She has not accounted for any of the money sent to her and is being investigated for her on-going animal abuse. I share your view donors are angry.It is terrible to trust someone to find out they are not who they say they are." With respect to NoToDogMeat, I have no proof that the organization is using the remaining funds from its fundraiser for personal use. What I do know is that hundreds of people donated over $70 000 to the charity and the majority of those funds did not make it to the intended recipient. What I find even more troubling is that if indeed Ms. De Cadenet's claims that Mrs. Yang is a fraud and an animal abuser are true, it is incredible that a registered charity that purports to end the suffering of dogs and cats in the meat trade blindly gives thousands of dollars to an individual who contributes to the ongoing suffering of those same animals. NoToDogMeat also maintains that for some time it has been fighting to prove its legitimacy in the face of continuous harassment by another group doing its best to smear the organization. Which brings us to the second party in the battle, "saynotodogmeat.net". As far as I can tell saynotodogmeat.net is not a registered charity anywhere in the world, and if one were to do a simple online search, it appears the organization spends much of its time writing articles trying to discredit NoToDogmeat. According to it's own statements the organization was founded by a, "Dr. Jose Depre", yet no actual credentials can be found for the individual. saynotodogmeat.net has linked itself to, "International Animal Rescue Foundation (IARF)", an organization that has its share of detractors. Some maintain that Dr. Jose Depre and Jon Williamson, founder of IARF, are one and the same, an individual who uses several other aliases, including Joseph Demetri, to defraud the public. I sincerely hope that is not the case. Of course there are two more parties caught up in this ongoing battle. The first is YOU, the donors. As always, make sure to do your homework before donating to any organization. If you are suspect, ask questions. If you are not given straight answers, move along. There are so many legitimate organizations that will happily address your every concern without becoming defensive or trying to deflect any accusations. I am not on NoToDogMeat's side nor am I on saynotodogmeat.net's side. I am on the side of the fourth party in this debacle, the party that is suffering the most. I think you know who I am talking about. What are your experiences with either NoToDogMeat or saynotodogmeat.net? Feel free to add your comments. Hopefully both these organizations truly have the best interests of the animals at heart. In the meantime? I'd be very wary of donating to either organization unless you can be 100% sure your money is going where you want it to.